As I travel around the UK there are the odd sign of the coming General Election. Relative to the activities that one would see in the USA they are, however, indeed relatively muted, and the signs, even on the motorway, are no larger or long lasting than those that have, on occasion, decorated our front yard. But with the slurring remark about a voter by the current Prime Minister the entire MSM has become convulsed about the story. Having, in my distant youth, worn a live mike to the bathroom, I am entirely sympathetic with the poor politician, though he should be experienced enough to know better. But it does drive items, of what are really more important news, much deeper into the papers. Even without that issue taking the space it now does, I had to meander back to page 40 to catch what should be, in reality, a much greater concern for the British public. Britain could be forced to close 14 power stations if a proposed European directive becomes law, a move that would drastically cut power supplies and endanger energy security, the Confederation of British Industry has warned. "Britain is gearing up for a six-fold increase in the amount of energy we get from clean sources in the next decade, so these CBI scare stories show that the French and German energy monopolies they represent are now seriously worried that the clean tech industry will effectively squeeze out dirty coal power in this country." And here, of course is the rub. The CBI would have you believe that a quarter of the UK's electric generating capacity is threatened. While GreenPeace argues that increasing renewables negates the concern. There are a couple of things that become obvious from this table. Firstly the current UK Government recognize and buy into the need to reduce overall current traditional power sources. There is the recognized roughly 25% reduction on coal power use (note that by 2017 it is too early to expect any impact from CCS). However it is also remarkable that the supply of natural gas to be used in power stations is anticipated to rise 42% by 2017, something which neither of these two debaters have brough to public attention. At the same time nuclear power generation is anticipated to drop by almost 50%, while renewables only increase by 46%, which is a whole lot less than the 600% that Greenpeace is stating. The primary question becomes one as to whether or not the UK will be able to get enough natural gas to meet its demands and keep the pressure off renewables. At present there is a lot of complacency, given in part by agreements with Qatar over the supply of LNG. The agreement with Qatar will supply, though the Milford Haven terminal, some 20% of the UK need , which will then be re-gasified and fed into the national grid. But 20% of the national need still requires that the other 80% come from somewhere, since the volume will not even cover the rise in demand to meet the DECC projections. One of the things I did today was to visit the Lancaster Maritime Museum (in the UK), and they have an exhibition on the gas that comes to the UK from off the coast here. Because of that supply natural gas has been the greatest supplier of energy to the county. In 2006, the latest year with figures available, the supply was for 13,669 GWh of natural gas, 12,545 GWh of petroleum products, 585 GWh of coal and 423 GWh of renewables. (no nuclear). Since 2006 the supply had grown relative to UK demand, now supplying 10% of the national need at a level that is expected to be sustainable for 40 years. What I found interesting was that this NG was coal based, rather than the conventional petroleum (i.e. algae) based origin of the majority of the natural gas in the North Sea. But that is still only 10%. Now Rune, Euan not to mention Jerome and Rembrandt have posted regularly on the problems that Europe is going to face on natural gas supply. The doubts about the Russian ability to get Yamal and Shtokman into production on time continue. At present Shtokman is being pushed further back while Yamal is given greater priority. The Stern Report quoted the 2007 Gazprom report in seeing a steady increase in Russian supply. Anticipated future Russian natural gas production. 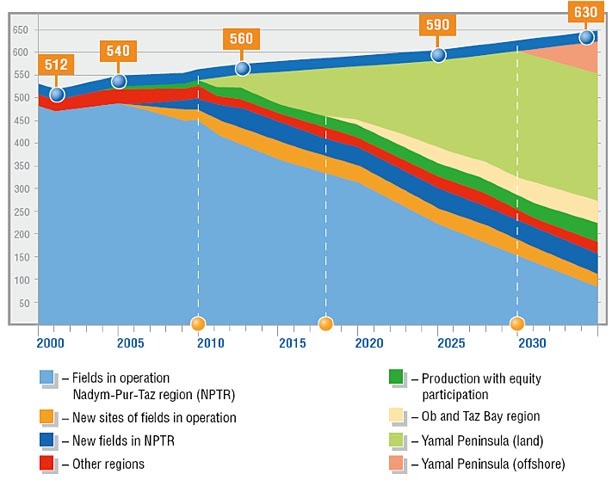 But notice where the majority of the gas will have to come from after this year - Yamal. And is the investment being made to produce that gas, and won’t an increasing percentage be consumed by the growing Russian economy? There have been some questions over this past year as to whether the necessary investment has been made. And if not, given the quantities of Turkmen gas, and that of other adjacent states that may be heading to China rather than Europe, then additional supplies might not be available in a timely manner. Which brings us back to the overall question. If there is not enough importable supply of natural gas to offset the decline in nuclear and coal –fired electric power production, then the increase in renewable energy sources that the British Government (as opposed to Greenpeace) anticipate will not be sufficient to meet the demand for power, within the likely term (if normal) of the next Parliament. There is a widespread pessimistic anticipation in the UK, that the first thing that any new Government, regardless of party, will have to do is to carry out a drastic budget cut. With those cuts, and the lack of investment that they will also likely mandate, then that little page 40 story might get enough legs to move to page 1 before too awful long. 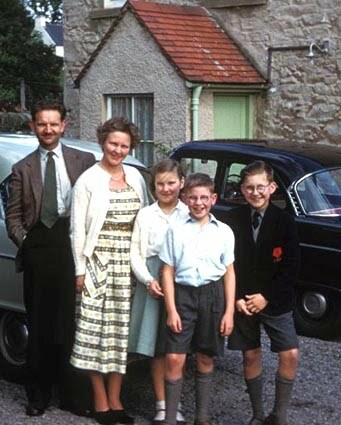 Oh, and why am I in Lancaster – well here is a 53-year old photo that might help explain it. And that may feed into another post, but we’ll just have to see about that. Smithy House, St. John's Town of Dalry, 1956/7? It has to do with the school uniform of the kid on the right. When they start saying that renewables will replace Coal you know they have an agenda. I wish the Greenpeace good luck with their Gas craze. And this post also shows how biased the credit rating agencies are.